There are just a few spaces left on our intensive workshops this May/June so don’t miss out on your chance to sign up to Manchester’s longest running comedy classes this Summer! Whether you’re looking to learn new skills, brush up on some old ones or just want to spend a fun weekend rediscovering your playful side there is something for everyone with our fun, friendly and affordable range of courses. 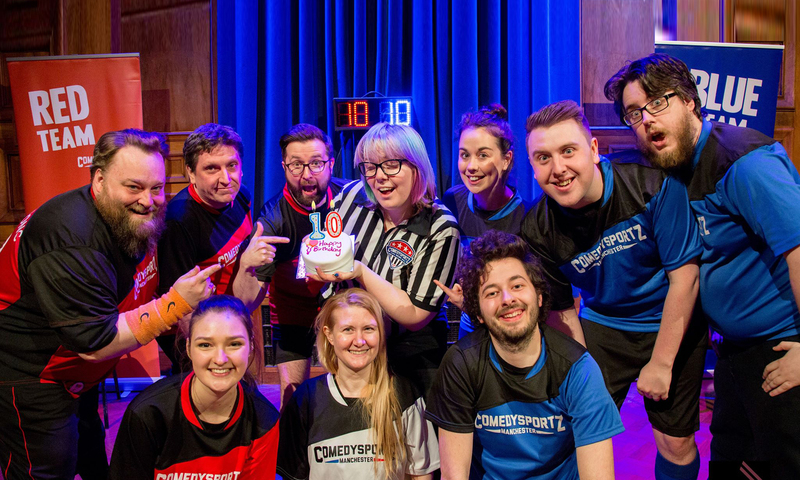 Learn the core skills of Improv comedy with ComedySportz including Yes, And, Listening, Objects and Storytelling. We’ll help you hone your comedic voice with this short course covering everything from material generation to mic technique. Craft your sketches in this two day course covering everything from the perfect premise to the killer punchline. This short introduction to longform improv will explore popular formats and edits. A deeper dive into creating whole improvised worlds and narratives. Find the key to unlock the skills needed for improvised songs and rhyme. You don’t need a great singing voice to take part just a strong desire to have some fun! Do all of your improv characters feel a little flat? Explore ways to bring new life to your on stage creations. Discover ways to engage your audience by employing performance skills to enliven your work presentations and brush up on your networking with confidence. Completed one of our courses or looking to hone your new material? Stuck in a rut and want to put a bit of spark back into your jokes? Then this stand up comedy class is for you! All prices include a non-refundable deposit (£30 for 2 Day classes, £10 for 1 Day classes). You can pay in full now or pay your deposit to secure your space and pay the rest later. If you’ve taken one of our (or similar) improv comedy classes before we will also be running a six week intermediate improv course. This will run at the same time as our intensives so there are discounts for anyone who signs up to multiple courses – get in touch today to find out more. Our courses and workshops are accredited by CSz Worldwide – one of the world’s largest schools for shows and comedy classes. Feedback from our latest 8 week stand up course. Want to know more about our courses? You can also come along to our Intermediate Workshops Showcase on Sunday 28th April at The Kings Arms (starts 7.30pm) which will be followed by a short improv jam and an opportunity to talk to course facilitators about our comedy classes. We are delighted to announce a series of intensive workshops and courses that will run throughout May and June in Improv, Stand Up, Sketch and so much more! As well as short courses that cover more specialised skills we’ll be starting this season of intensive workshops with two day versions of our Foundation in Improv and Beginning Stand Up Comedy courses. These classes are ideal for anyone who has not been able to attend or commit to our longer eight week sessions. Our longer courses will return later in 2019. You can pay in full now or just pay a small non-refundable deposit (£30 for two Day Intensives, £10 for one day intensives) to secure your space. All courses will run in the theatre spaces of the Kings Arms, Salford. 4th-5th May 2019. 12.30-5pm each day. £75 for the whole course. Learn the core skills and tenets of improvised performance including: Yes, And, Listening, Character, Objects, Storytelling, scene work, and an introduction to games. No previous performance experience required. Learn the core skills you’ll need to craft your first five minutes of stand up. Covering everything from material generation to mic technique we’ll help you find your comedic voice. No previous performance experience required. 18th-19th May 2019. 12.30-5pm each day. £75 for the whole course. This short course will help you develop written sketch material from the perfect premise to the killer punchline. We’ll look at ways to hone and craft your material as well defeating any writers number one enemy – the blank page! No previous experience required. 1st-2nd June 2019. 12.30-5pm each day. £75 for the whole course. This short introduction to longform improv will explore the depth of storytelling and character development possible through longform improv. This course will introduce you to popular longform formats & scene edits. Some previous experience in performance and/or improvisation is recommended. Attendees will also gain free entry to Improv Mullet our combined shortform and longform show on Saturday 1st June. 15th-16th June 2019. 12.30-5pm each day. £85 for the whole course. Find the key (geddit?) to unlocking your tuneful side. Covering everything from rhythm to rhyme we’ll introduce you to the core skills to help you improvise songs. We’ll help you find the confidence you need to sing off-script – and it doesn’t matter if you’re off-key either. No previous experience required. 18th May 2019. 12.30-5pm. £45 for the whole course. Often find yourself on stage just playing… yourself? This short course will explore ways to create characters that are as fun to watch as they are to perform. Previous performance experience recommended but not required. 19th May 2019. 12.30-5pm. £45 for the whole course. This intensive session will explore ways of using performance to skills to help you develop more effective presentations for business and events. If you’re the kind of person who dreads speaking in front of crowds then this safe, supportive workshop will help you find the confidence you need! No previous experience required. 1st June 2019. 12.30-5pm. £45 for the whole course. Is your set stuck in a rut? Whether you’ve previously attended our Beginning Stand Up Comedy course or on the circuit but going in circles, this intensive workout will help you stretch your creative muscles and hone those funny bones. Don’t delay and visit our workshops page today to sign up with Manchester’s longest running comedy performance courses. Got questions about any of our workshops or classes – perhaps you’d like to know more about our workshops for schools and businesses? Please don’t hesitate to get in touch. Improv Workshops Last Few Spaces! There are just a few spaces left on our Foundation in Improv Workshops commencing 16th February! Don’t miss this chance to learn from Manchester’s longest running comedy improv classes and sign up today. Whether you’re a budding performer or a professional hoping to learn new communication and listening skills or someone who just wants to have a bit of fun for a couple of hours on a Saturday, our workshops have something to suit everyone! Build confidence, learn the core skills and tenets of Improvised performance and meet new people in a safe and supportive environment. Workshops are fun, friendly and above all, affordable with no stage experience necessary! Our workshops have featured The Guardian Online, The Stage, Cosmopolitan UK and Manchester Confidential. Our courses and workshops leaders are fully accredited by CSz Worldwide, one of the world’s largest comedy improvisation schools. Visit our workshops page today to reserve your space. You can pay in full now or pay a non-refundable £30 deposit and pay the rest later! Already have some experience in improvisation? There are a few spaces left on our Intermediate Improv course. This is open to anyone who has recently taken our 8 week Foundation in Improv workshops or an equivalent course/experience. It’s best to be honest with yourself and your skill level as the intermediate course assumes a level of pre-existing knowledge/experience. Sessions cover everything from deeper character creation to improvised rap on a rolling curriculum. If you feel you may benefit from a refresher it is advised to try our Foundation in Improv workshops first. If you have any queries about our courses please don’t hesitate to get in touch today!